In Japan Panasonic has a generally excellent reputation when it comes to being environmentally aware (admittedly, recent green legislation plays a part), so it’s no surprise to see that its latest home washer-dryer tackles the thorny issue of waste in pretty spectacular fashion. 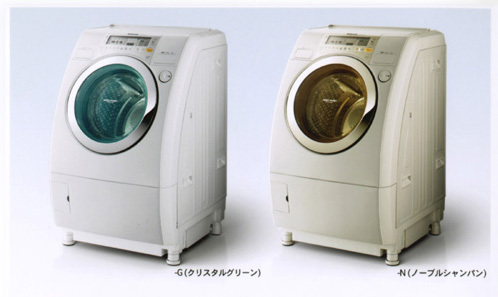 The new drying system dries clothes by exchanging heat via a heat-pump unit. As it does not let heat or moisture escape outside the dryer drum, it is highly energy efficient. Also, the superior drying and moisture removing capability dries garments more quickly. For example, three dress shirts will dry in 20 minutes (one-third of the time) and a bulky blanket in one and a half hours (one-half of the time), compared to other conventional dryers. We, as dedicated wearers of only the finest dress shirts, genuinely welcome saving time, the Earth and the predicted ¥24,000 yen a year. You rule, Panasonic.